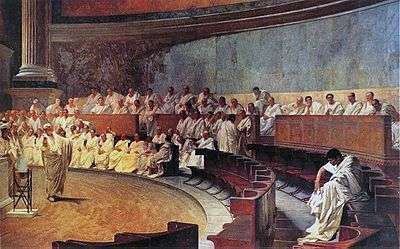 Roman law is the legal system of ancient Rome, including Roman Military Jurisdiction and the legal developments spanning over a thousand years of jurisprudence, from the Twelve Tables (c. 449 BC), to the Corpus Juris Civilis (AD 529) ordered by Eastern Roman Emperor Justinian I. The historical importance of Roman law is reflected by the continued use of Latin legal terminology in many legal systems influenced by it. 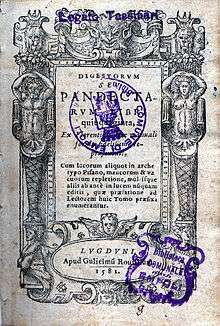 Roman law also denotes the legal system applied in most of Western Europe until the end of the 18th century. In Germany, Roman law practice remained in place longer under the Holy Roman Empire (963–1806). 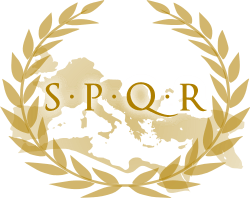 Roman law thus served as a basis for legal practice throughout Western continental Europe, as well as in most former colonies of these European nations, including Latin America, and also in Ethiopia. 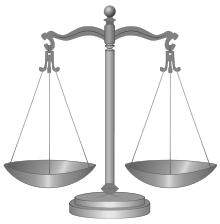 English and North American common law were influenced also by Roman law, notably in their Latinate legal glossary (for example, stare decisis, culpa in contrahendo, pacta sunt servanda). Eastern Europe was also influenced by the jurisprudence of the Corpus Juris Civilis, especially in countries such as medieval Romania (Wallachia, Moldavia, and some other medieval provinces/historical regions) which created a new system, a mixture of Roman and local law. Also, Eastern European law was influenced by the "Farmer's Law" of the medieval Byzantine legal system. ↑ Herbermann, Charles, ed. (1913). "Roman Law". Catholic Encyclopedia. New York: Robert Appleton Company. 1 2 3 4 5 6 7 "A Short History of Roman Law", Olga Tellegen-Couperus pp. 19–20.